All the smartphone has lots of personal information like emails, messages, call logs, contacts, notes, videos and images and no one us want to share these information with others. The best way to hide all this personal stuff is to lock all the important application on the android devices. There are tons of application are available on the Google play store which provided you the option to hide or lock your personal files. Today in this guide we’ll show you a new application called Lockdown Pro – App Lock, which can lock any app, such as SMS, Gmail, Facebook, Whatsapp, SnapChat, Instagram, Viber, Line, Evernote, etc and special apps. With the help of this free application your lock your app with Pattern or Pin. All you have to install the application form the Google play a tore and set the lock pattern or Pin to lock your android mobile or tablet applications. Lets take a look how the application works. Download and install the LockDown Pro application on your android, you can find the direct download link of the app at the end of this post. Launch the application on your device and select the lock type classic or pattern. In classic you can use the 4 digit pin number to lock the app and in pattern you can draw thew pattern. Once the security lock is set you can lock any application on your device. 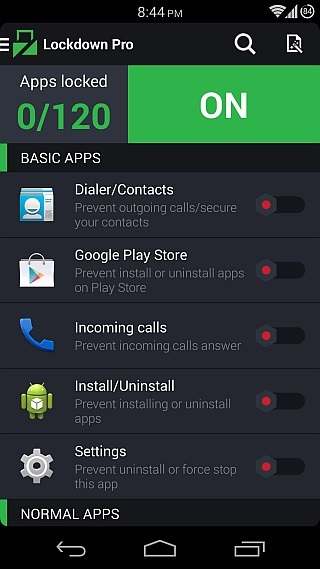 All you have to do is enable the security lock on each app and the apps are protected on your device and no one can use those app without unlocking them. Each app here has a toggle next to it, using which you can protect or unprotect it. Not only this you can also hide the Lockdown Pro from your App Drawer. With the helps of this new feature you can easily Remove Lockdown Pro icon on App Draw & Home screen. To enable this feature all you have to make some change on the Lockdown pro settings page. 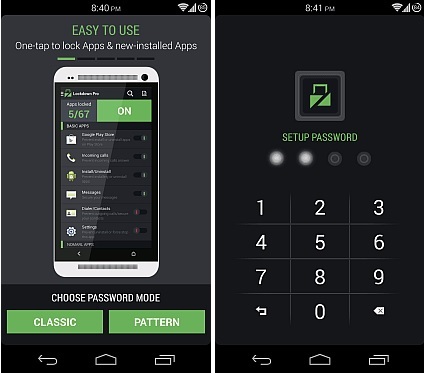 Lockdown Pro is one of the best app protection solutions we’ve seen on the market.